PARIS, France (CNN) -- Opposition lawmakers Tuesday ridiculed President Nicolas Sarkozy for taking France back into NATO's military command after more than 40 years, but were unable to stop the move when it came to a vote. 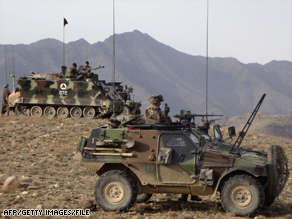 French troops on patrol with the Afghan army as part of the NATO mission in Afghanistan. The National Assembly voted in favor of Sarkozy's plan, 329-238. Socialist Laurent Fabius, a former prime minister, told Prime Minister Francois Fillon: "You tell us this would mean more independence and more influence. It would probably mean less independence and less influence." The move did not technically require parliamentary approval, but the president's party scheduled the debate to give opponents a chance to voice their opinions -- and to show a majority backed it. Asking the National Assembly to vote on the issue also showed how sensitive the matter is in France. France was a founding member of the NATO alliance in 1949 but it left the military structure in 1966 amid friction with the United States. "To cooperate is to lose your independence," French President Charles de Gaulle said at the time. For the next 43 years, even though France selectively participated in NATO military operations, de Gaulle's principle remained the governing cornerstone of French foreign policy. If Paris took orders from NATO military commanders, it was reasoned, the nation would no longer have complete control of its destiny. Sarkozy, however, believes the opposite -- that cooperation in NATO is a guarantee of French independence. Rejoining NATO's military command, he argued, will give France a seat at the table for decision-making. From its earliest years, the organization's trans-Atlantic ties were strained because U.S. analysts warned that if the European allies failed to increase their contributions to the alliance, they risked losing the support of the United States, according to NATO. Meanwhile, the European nations felt the United States was trying to dominate the organization, according to NATO. De Gaulle's 1966 decision meant no French forces could be under permanent allied command and that France would have no participation in defense planning. In 1995, France rejoined NATO's military committee, which advises NATO's political authorities on military policy and strategy and provides guidance on military matters to NATO's strategic commanders. While France was still not a part of the military command, it contributed troops and funding to NATO activities, including actions in Kosovo and Afghanistan. Half of all French troops outside the country are assigned to NATO military operations. Opponents of Sarkozy's move -- who include some members of his party -- believe de Gaulle, not Sarkozy, had it right. They started a last-minute petition drive to stop his march back into NATO. "With this decision, France will return as a subordinate country and will lose its ability to represent another image in the world," said Nicolas Dupont-Aignan, a member of the French National Assembly. The president's allies calculate Sarkozy's move will strengthen Europe's hand on defense issues. "There will be more European weight in the way decisions will be made," said Louis Giscard d'Estaing, a member of the National Assembly's U.S. Friendship Committee. "Therefore, the balance of power between the USA and Europe will be re-established within this French move."